We all count down the minutes left till Apple finally unveils the new version of its iOS. With WWDC 2013 being around the corner, the designers don’t waste time playing guesstimation, but create their own concepts of what the iOS 7 may look like once it arrives. 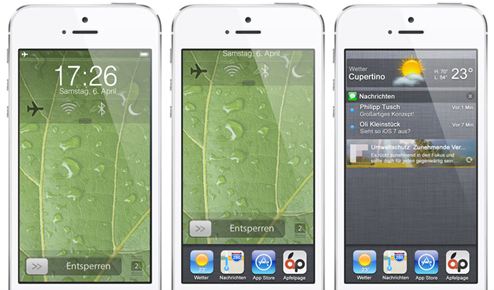 The concept we present below is a creation of a German website dedicated to iPhones, which sought to be realistic in this particular concept and embed as less speculative features in their iOS 7 ideas as possible. Along with bringing toggles to the lock screen, which was covered previously within the jailbreak scene, the concept suggests several interesting alterations and enhancements. These include the integration of Notification Center and multitasking bar into the lock screen as well as the home screen, a revamped, Mailbox-like Mail app and some more. Check out the full video embedded below and do not hesitate to let us know your thoughts by sharing them in the comments section.